The anecdote takes place in Gran Turismo's studio Polyphony Digital offices in Tokyo, march 1999. I sit in an interview room with developers from Omega Boost (the only non-racing game from PD), along with a dozen of other european journalists. OB, a shoot-them-up, has something special: it is then planned to be one of the very first game to make use of both stick off the new Dual Shock controller (original PlayStation controller had only a cross pad and buttons). And here comes the question from one of us: “Are you sure that players will be able to use both stick simultaneously? I mean, is our brain capable to handle this?”. Believe it or not, but nobody laughed at him. What we know today to be a second nature for millions of players (COD audience is high enough to make this assertion true) used to rise levels of scepticism back then. The gap between low expectation about ourself having to cope with a challenge and our proven true potential could be filled with a known process: the Tetris Effect. “A prevailing theory known as the Tetris Effect states that when a person initially starts to play Tetris, their brain consumes a huge amount of glucose in order to solve its fast-paced puzzles. Through consistent and limited daily practice, the brain begins to consume less glucose to perform just as well, if not better, at Tetris. After a few months the brain becomes so efficient at playing the game that it requires only a very small amount of fuel to perform the game’s rapid puzzle work.” wrote J. Fordham from thebeautifulbrain.com, based on several scientific studies. Or, in a short way: if you think you can’t do it, just do it. (Very small amount of) Time will solve the problem as your brain will silently optimizing itself for you. 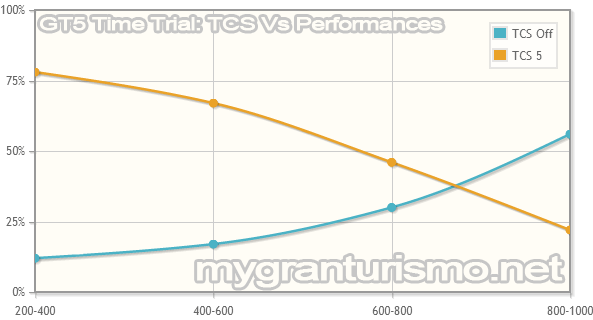 The following graph shows evolution of % of players with or without TCS, based on the mygranturismo.net performance indice range (0 - 1000): left is low perf, right is high perf. Based on 7.5 millions posted times. @et_ , 800-1000 nscore means way more players than 200. Theese graphs just cannot be correct! According to the graph, there would be about 40% of people still using TCS in the top N-score range. In my experience, none of the top players use TCS. Within the top 200, there rarely is anyone with TCS, and if it is, its set to TCS 1. @Deko Wolf-GTPT: Being faster without aids is not to be at your best, I abandoned the aids a long time ago. at that point i usually placed around 500-600th. Today I'm almost always in the top 20! Given more practice and time, I'll get even better still. I see the point milouse is trying to make but i agree whole heartidly with gamerdog6482 there are far too many variables with tcs its not just on or off. Also the graph only illustrates the tcs at level 5 which is always going to have a negative impact on ultimate speed and lap times. After reading this I decided to try TT44 with 60's sports car without any aids at all. Oh, okay. Thanks for the explaination. @gamerdog, 200-400, 400-600 etc. are Nscore ranges. Nscore is a performance indice calculated on myGranTurismo.net for each record in the game leaderboards. It is based on the best performance on each leaderboard (which scores 1000 by convention). It gives comparable performance evalulation from board to board, hence allow such statistic. Nscore range from 0 to 1000 (i doesn't include range 0-200 as it is partially populated with "trash" time from player who didn't even try or gave controller to there 5 yo child). What I wasn't sure of is what the lines were actually representing. It says that the %s are the % of players, but what does the "200-400" and so forth mean? @gamerdog, there is a short explanation under the graph you may have missed. I guess you think i tried to give a meaning to the graph beyond what it is. If, from a large point of view, TCS had no influence on efficiency, the two lines would be flat (not equal, flat and parallel: overall distance between lines only means TCS is more or less used by players). That said, you're right to point that TCS can be turn on in some circumstances. But to be able to do so, you need to know how to play without it, and not stick with the "always on" setting, which is the point of the article (which also only take TCS as an example among all driving helps). I disagree. Driving aides are a part of tuning, and cars react to application of TCS in different ways. 4WD and AWD cars suffer greatly from traction control no matter what, but RWD (Mainly FR and MR) cars benefit from TCS much moreso than FWD cars do. RR is another story altogether, but as a tuner I simply see TCS as another setting to play around with per car. And that graph doesn't make any sense. What is it trying to say? Keeping your mind clear also helps improving your driving skills. Ignore your surroundings. Keep all distractions away from you. exact point at where you can perform better. is the point where you realized that you have reached your best.